Millie is hands down one of the greatest pups you’ll ever have the pleasure of meeting! 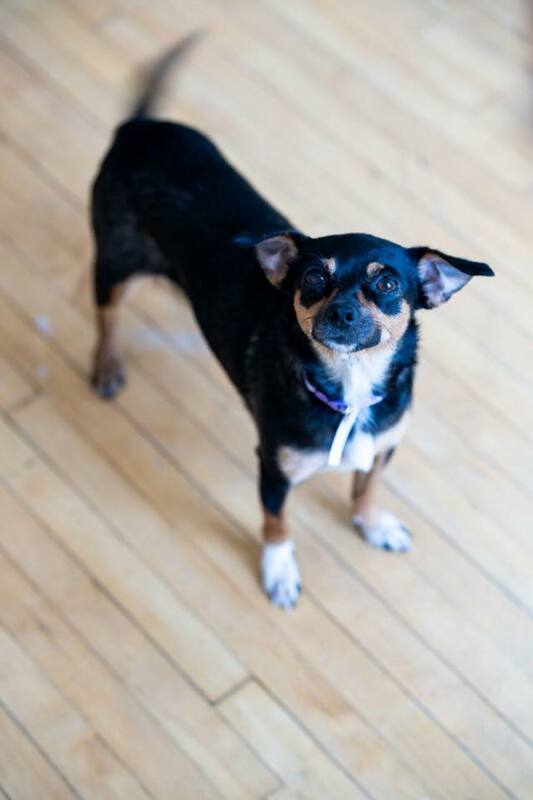 This little fire cracker is a 1 year old Chihuahua mix, but don’t let her small stature fool you! She is incredibly confident for a chihuahua and loves to act like she’s a giant! She is also THE MOST loving, cuddly, squeaky, adorable dog ever. When you come home, whether it be 5 minutes after leaving or a few hours, she gets so excited that you can’t help but feel like you are the most special person in the world. She will push past her foster brothers (a dog and a cat) to get as much love from you as possible. She loves to give sweet little angel kisses, and if you don’t scratch her enough, she will fully grab your hands and bring them back to her so you keep going. She has 2 modes: crazy hyper and completely sleepy and chill. Luckily the crazy hyper doesn’t last too long and it’s usually pretty hilarious to watch. This little babe is FULL of personality and humour. All she wants is love all the time from anyone, but especially from her people. She is very quiet, but will bark every now and then when she wants to protect her humans. Millie also gets along insanely well with her foster brothers (a cat and a dog). It would probably benefit joining a household that has another dog, as she loves the company and the additional playmate. Millie has started to learn basic commands like sit and lie down (although at the moment it’s mainly on the rug and not on the hardwood) and she is almost fully house trained!! When you get to know her schedule, it’s easy to avoid accidents in the house, although they do happen from time to time. Millie can hold her own with big dogs, but if she feels nervous she will ask for you to pick her up or she will hide behind your legs. Although you never know…a sudden burst of confidence can surge through her tiny body and she will run circles around any dog in the area. She is incredibly fast! Lastly, Millie is THE PERFECT dog to take to work with you! Whether you work in a pet friendly office or a studio space, Millie loves being able to say hi to everyone, get some love and snuggles, and then lie in her dog bed and sleep the day away. Honestly, anyone would be so lucky to have this little angel in their lives. She will change your life for the better and you will never not feel loved when she’s around.